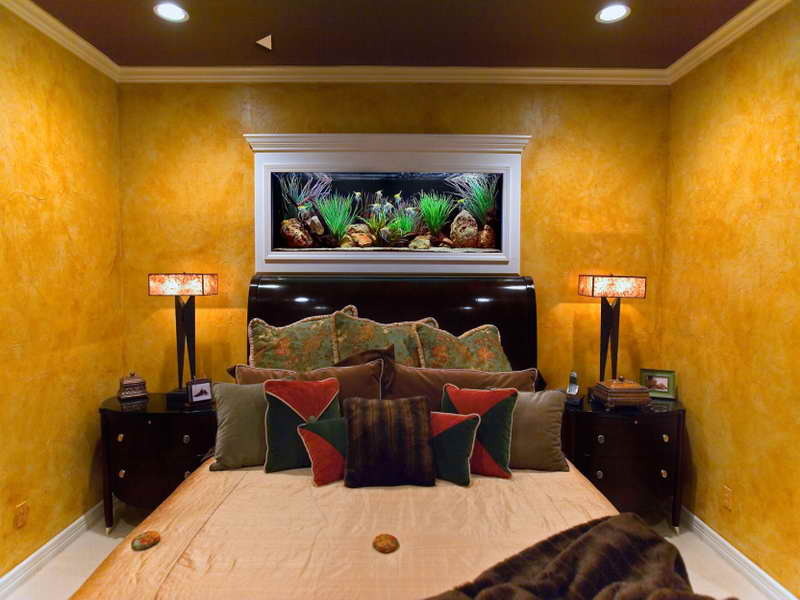 A saltwater or freshwater aquarium can be a great addition to any room that could use a little exotic flair, no matter what size. 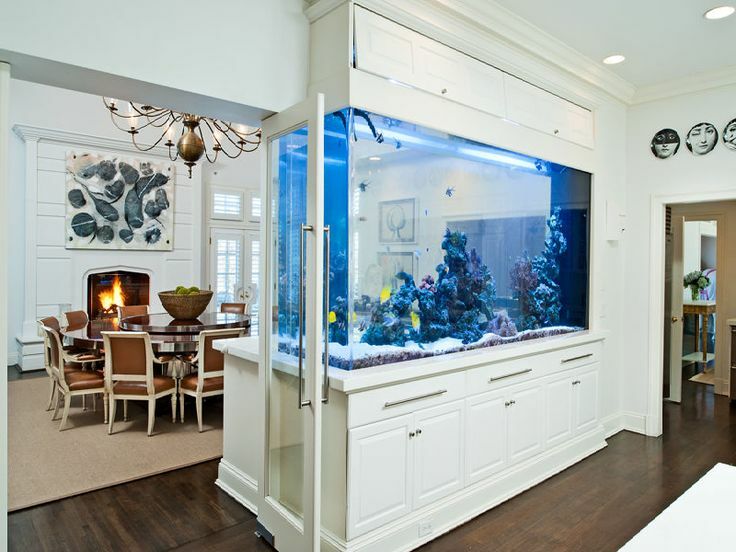 Obviously, the bigger the tank, the more of an impact it’s going to make on the room. 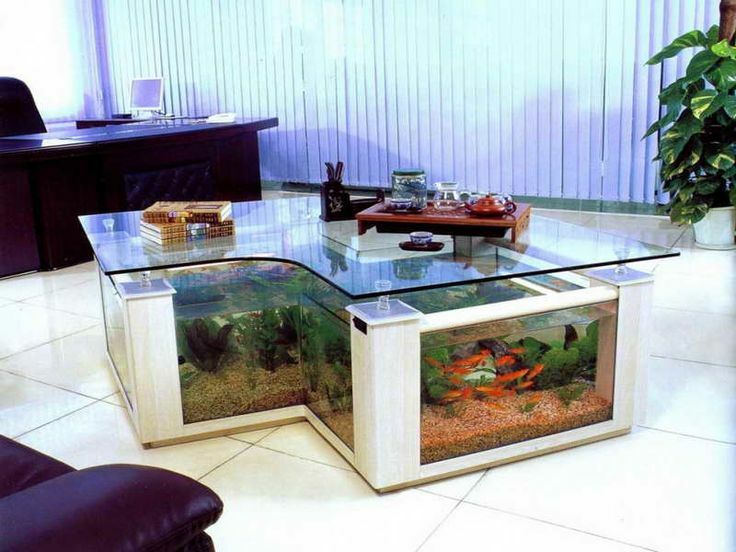 You can get massive furniture pieces specifically designed for tanks that hold tens or hundreds of gallons of water, which are certainly necessary, but are big and bulky and often end up taking up a lot of space. 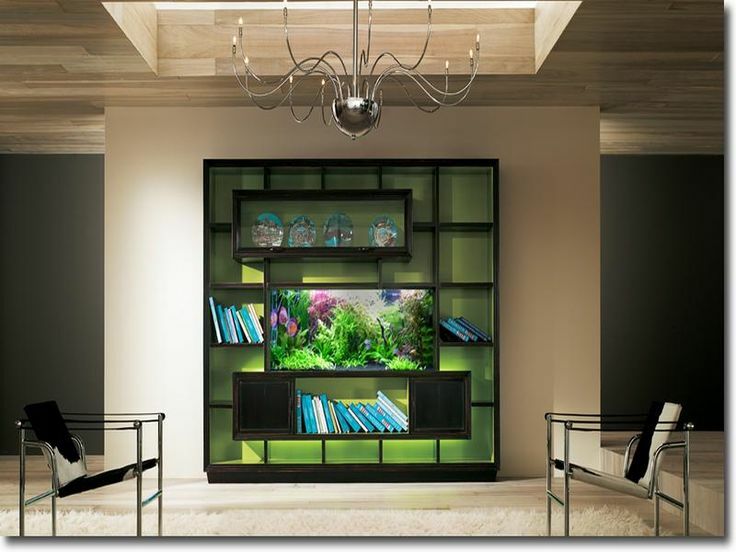 Instead, why not work your aquarium design into your furniture or architecture of your home? 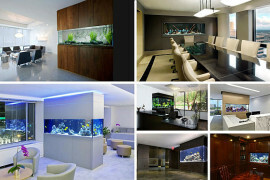 Here are a few breathtaking ideas to inspire you! 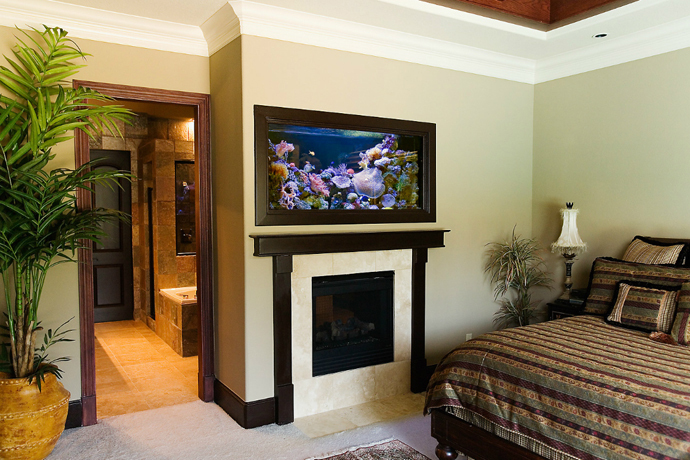 If you have the opportunity to use your aquarium to divide two rooms up, then there’s no better way to feature it (and save space too). 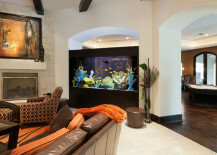 An aquarium featured on Design Rulz actually takes advantage of an open archway, while this other large wooden aquarium furniture piece from Home Designing stands right up to the ceiling and separates the dining area from the living room. 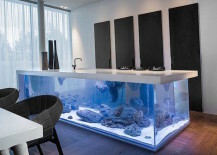 This incredible kitchen island featured on The Kitchn doubles as a massive aquarium. 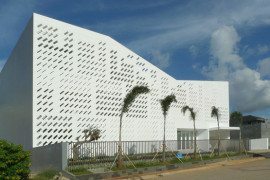 What a great use of space! 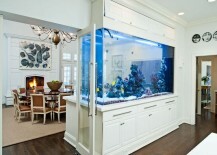 A similar example featured on Piatti has a smaller aquarium that doesn’t take up the full island. 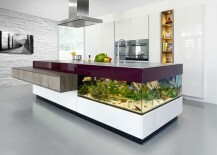 Kitchen cabinets are often attached to the floor and ceiling, with space in between for countertops. 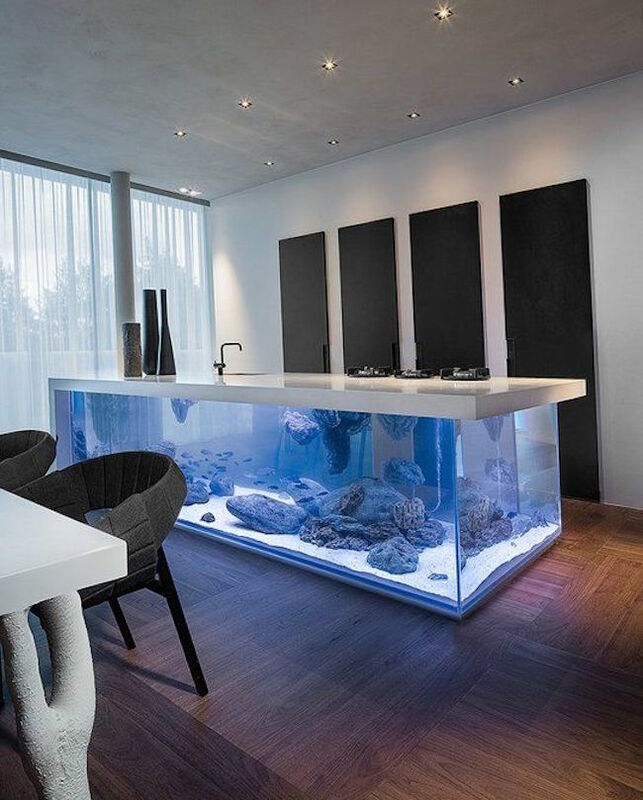 If you can afford to sacrifice some countertop space, why not use it for your aquarium? 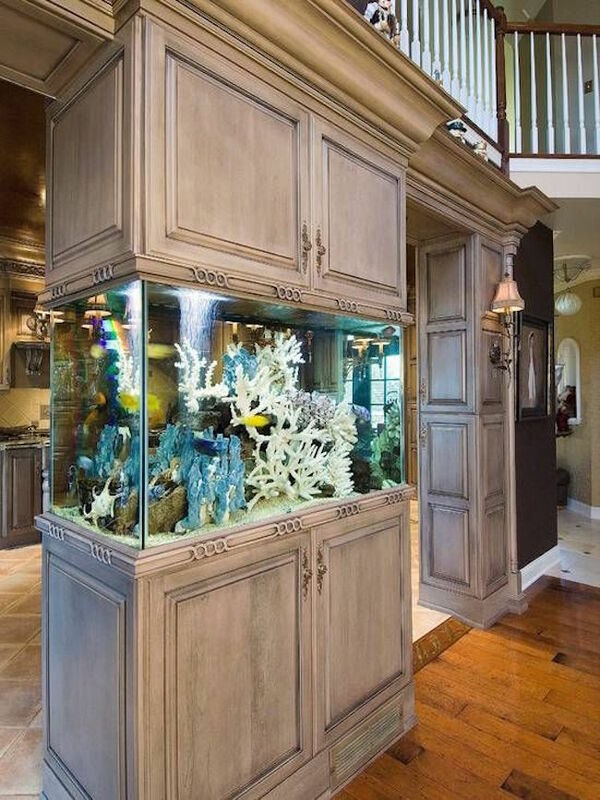 Here’s a gorgeous example from Paradise Homes that not only makes use of cabinetry space, but also works as a room divider too. 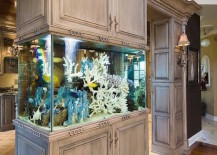 Another example from Lush Home shows a pair of upper and lower cabinets with an aquarium in between, also used to divide the kitchen from the hallway or living room. 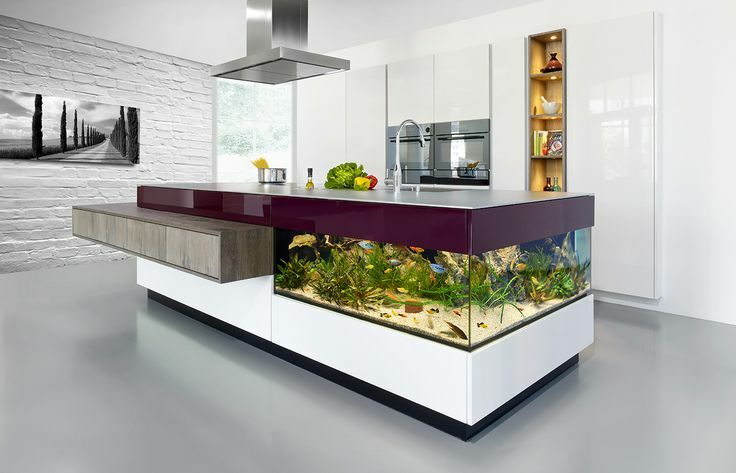 This aquarium built into the kitchen cabinetry leaves a small section of countertop space available for storage or eating. 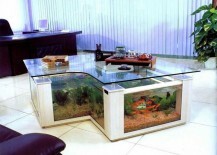 If you thought the kitchen islands with built-in aquariums were neat, you’ll love the idea of coffee tables too. 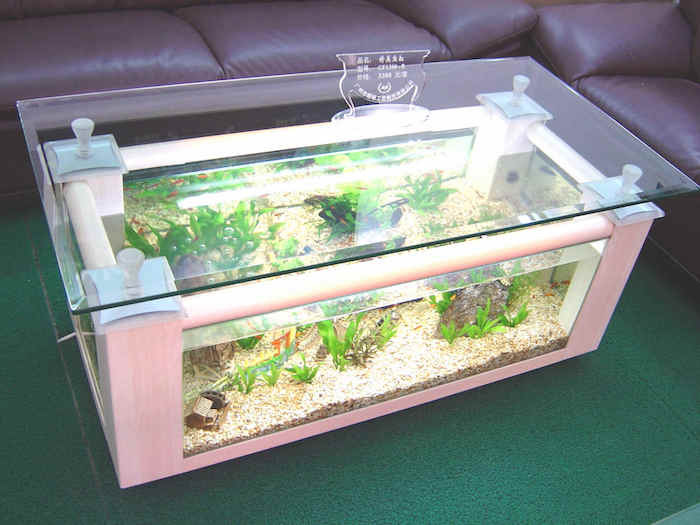 4 Fish Tank actually makes and sells these gorgeously unique coffee tables in all sorts of shapes, sizes, and styles — with plenty of glass so you can enjoy watching the fish! 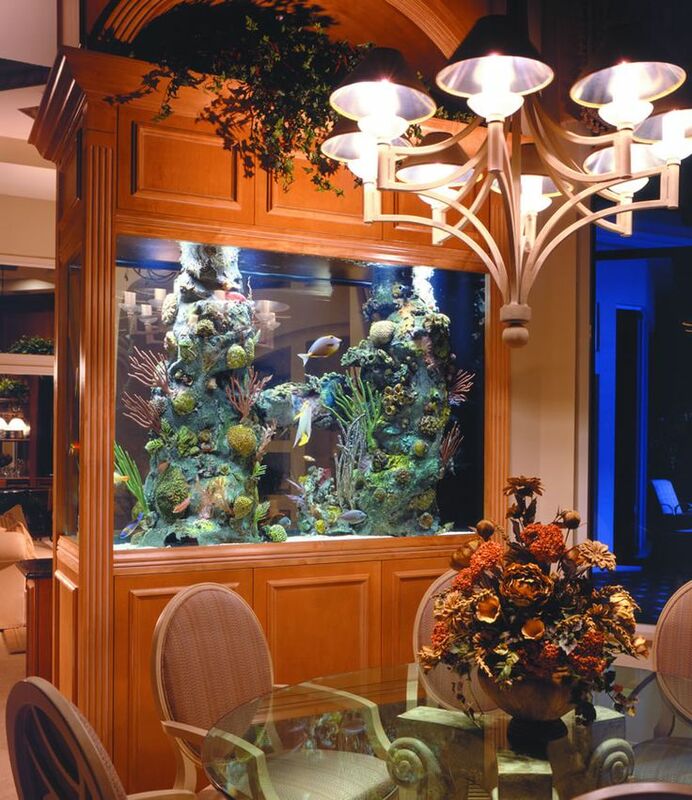 There are lots of different ways to spruce up a boring looking fireplace, but perhaps none so creative as adding an aquarium to it. 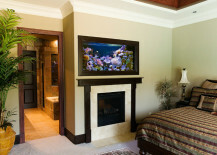 The only thing you’d have to really keep an eye on would be the water temperature whenever the fireplace is in use. Check out this aquarium built directly into the wall above a bedroom fireplace, again from Design Rulz. 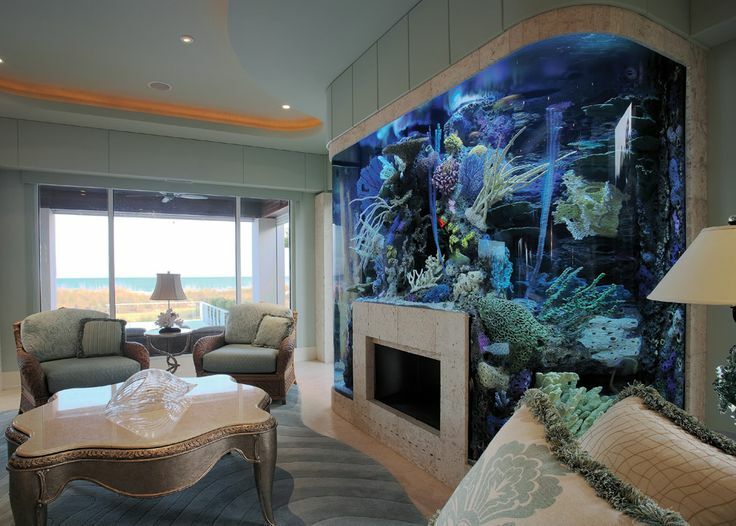 Taking it up a notch is this massive aquarium featured on If It’s Hip It’s Here that completely surrounds the fireplace in a living room or lobby area, which is likely part of a luxury hotel. 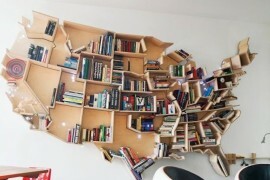 Could you imagine having something as unique as this in your home? 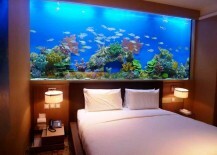 Who needs a headboard when you have an enormous aquarium in the bedroom instead? 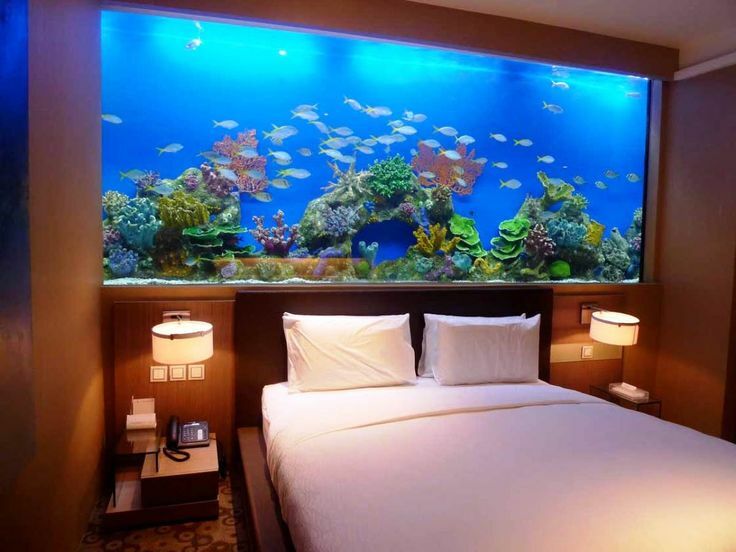 This hotel room from Real House Design quite literally lets you sleep with the fish. 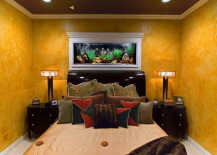 If it’s too big for you, you can keep your headboard and instead go for a smaller aquarium that’s comparable in size to a piece of wall art. 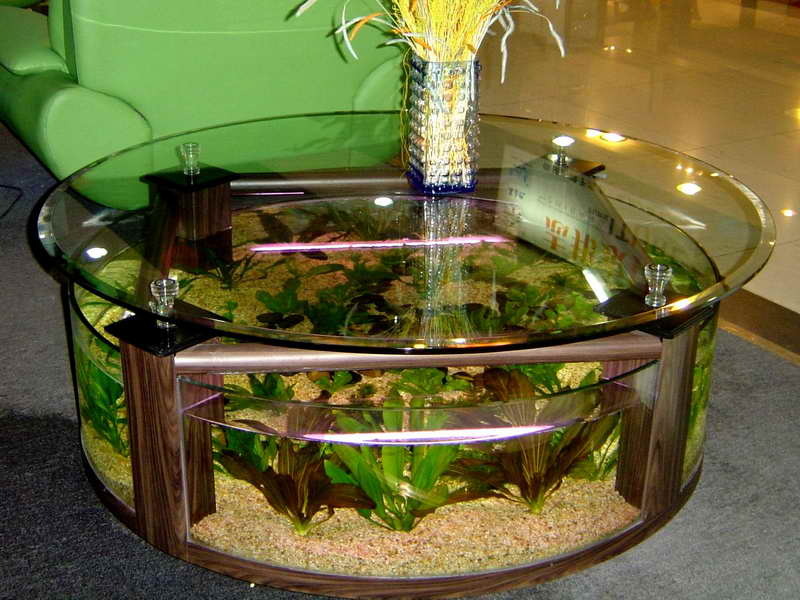 You might go for a real one-of-a-kind aquarium furniture piece if you’re feeling super creative. 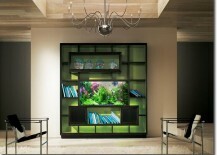 A modern shelving unit shown on Vizimac has a unique space for an aquarium right in the middle of it. 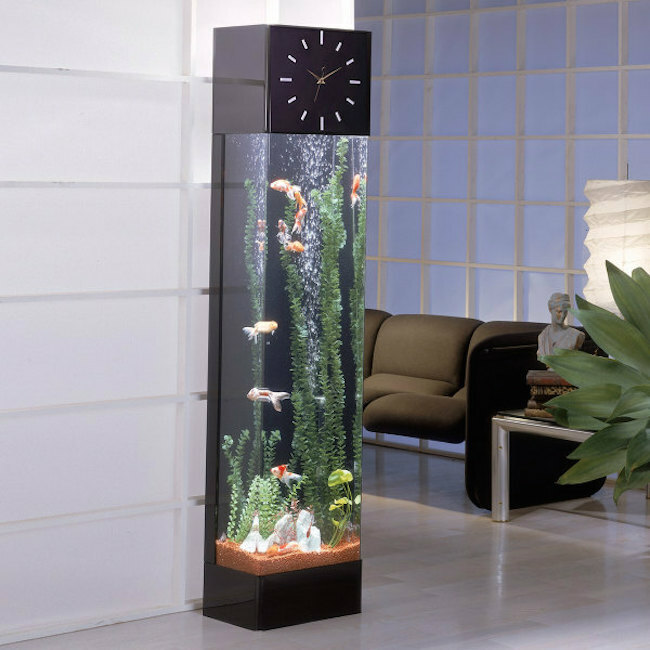 Here’s something you don’t see every day — a very modern looking longcase clock featured on Spicy Tec that’s mostly water and fish. 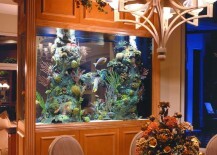 If fish could tell time, they’d let you know every time you were late to feed them. 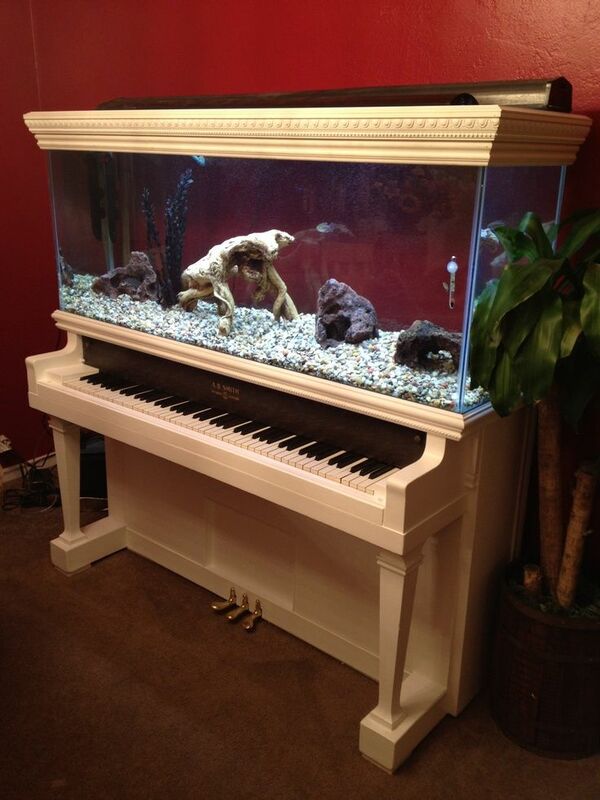 If you don’t have any use for an old upright piano anymore, you could consider pulling out all the strings and turning the upper part into an aquarium — like this one from Buzz Buzz Home. 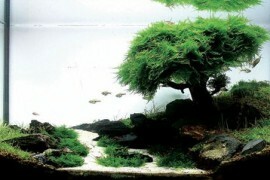 It’s so much more elegant and fascinating to look at compared to a regular tank holder. 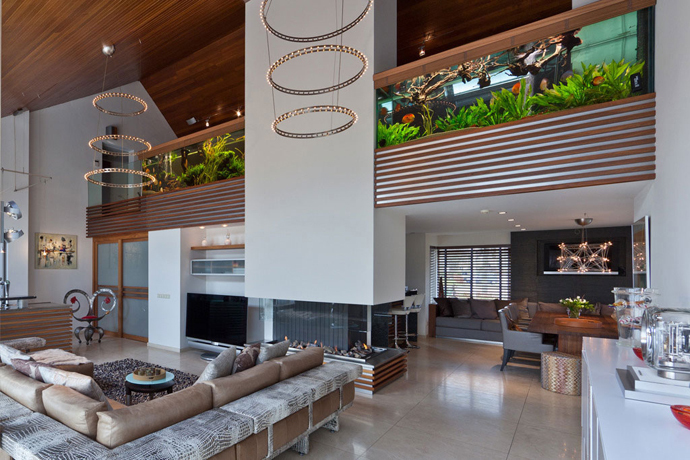 Last but not least, you have to see how this loft incorporated an aquarium on its upper level, again featured on Design Rulz. 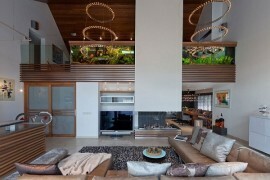 Anyone on the bottom floor could simply tilt their head up to have a look at the fish swimming above their heads. 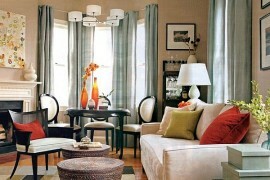 What a great alternative to a regular banister!